Leverage the industry leading digital shipping and print fulfillment tool to manage, print and deliver your time-sensitive documents. Send your files to print with a click. Simply upload your file which is securely sent to one of our 190+ Global ARC locations where it is printed and delivered locally when you need it. Securely send up to 3 GBs, directly from Microsoft Outlook or ishipdocs. Invite others to view, edit, or upload files by converting your folders into shared workspaces. Track sent documents. Track the number of downloads and order, print, and delivery status. Replace FTP with a convenient tool that can securely receive multiple large files from anyone. Simply send a link or add the tool to your site. Create and manage teams. Set access permissions by user, department, team, or company. Store and backup documents in your cloud. Access and share them anywhere. Check out all the benefits and advantages of digital shipping and print fulfillment services. Previous of work are automaticaversionslly saved as your team works on revisions and updates. View them any time. Share feedback and engage in discussions within your workspace. Don't miss a beat with automated email notifications. Ship digitally and print locally using our 350+ print locations. Send up to 3GBs directly from your email by installing our Outlook plug-in on your device. 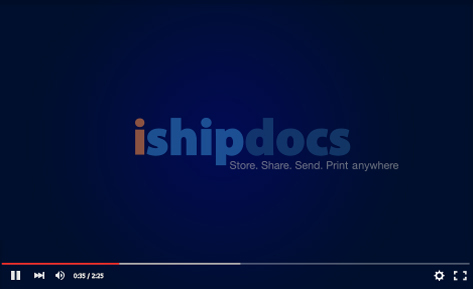 When I need something done right away, ishipdocs lets me upload files, specify exactly what we need in terms of number of copies, size, finishing, and then direct the job to a destination I choose and trust.